Tegan Woo of Amoda Tea contacted me in November 2014 about the company's Fall Picks Tasting Box. I received a discovery set* with 5 craft teas: an oolong named Three Blessings by Swan Sisters, a chocolate minty rooibos from Tay Tea, and three black teas. 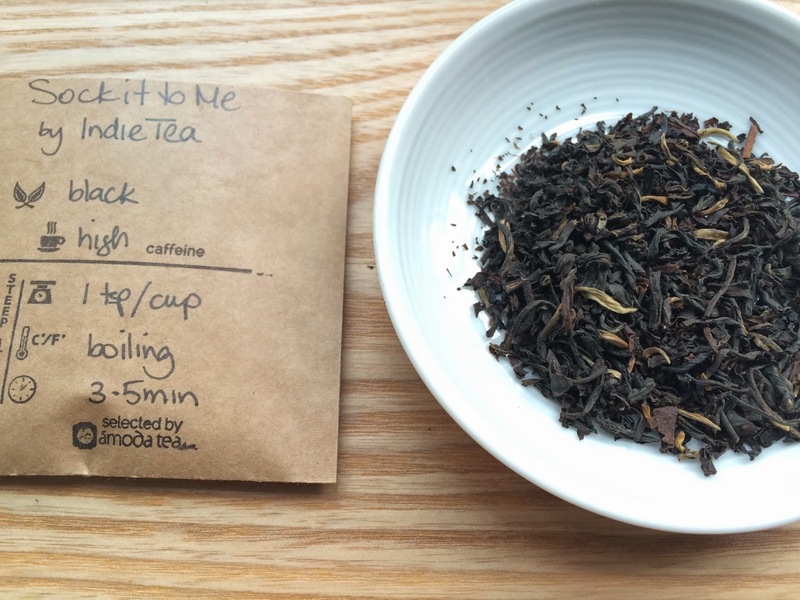 The black teas will be reviewed on the blog beginning with Sock It To Me by Indie Tea. Sock It To Me is a blend of five organic and fair trade black teas: Golden Monkey, Yunnan Gold, Banaspaty, Qu-Hao, and Korakunda. Notice the golden threads among the loose leaves? That's the Golden Monkey. I steeped the packet of tea in a pot of boiling water for 3 minutes and served with and without (whole) milk. It is delicious both ways. The milk definitely smoothed out the briskness of the blend though the unadulterated tea was not astringent. 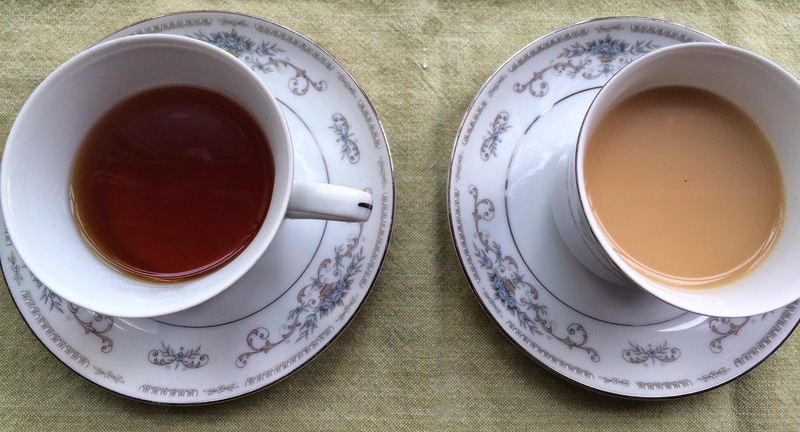 The tea is malty and smoky; the latter is especially detectable when you smell the tea. I tasted fruit and sweetness and some chocolate (cocoa) notes. Yunnan Gold is known for its cocoa flavor. Banaspaty is an Assam which could be the source of the malty flavor. Qu-Hao is a Fujian black. According to teaspot.com, "Hao’s full rich body is incredibly low in tannins with a natural note of chocolate, earning it the nickname "Black Silk". Finally, Korakunda is grown in Korakundah in the Nilgiri Mountains of India. Even if you don't subscribe to Amoda Tea, I'd recommend purchasing Sock It To Me to black blend enthusiasts. 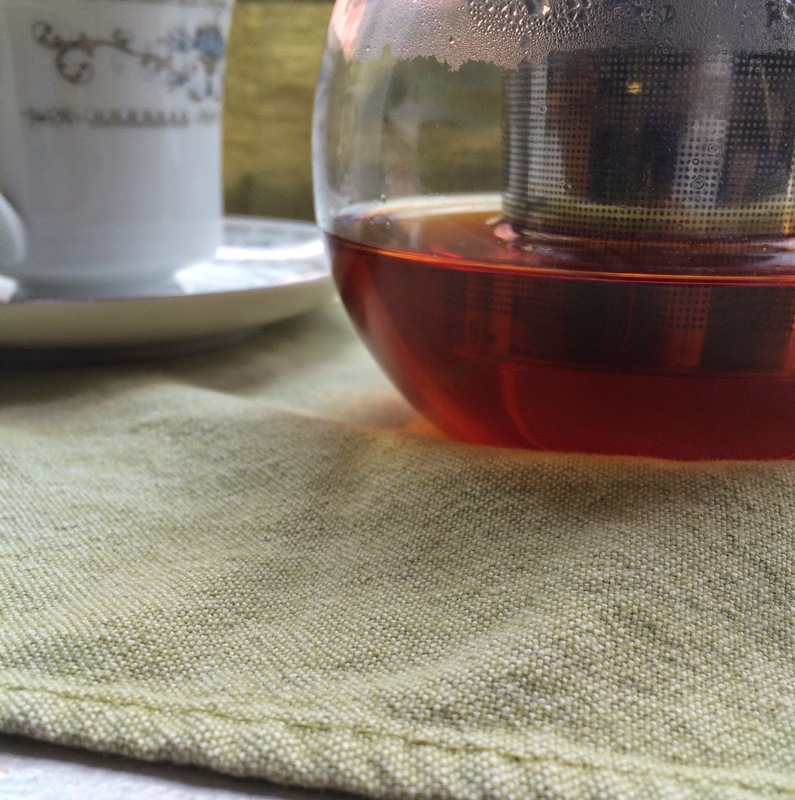 You can buy via Amoda Tea or directly from Indie Tea. * Amoda Tea still offers "discovery sets" but its primary tea tasting box is The Monthly Box, a monthly subscription box containing 3 cup samples of 4 different craft teas, steeping instructions, tasting notes, biodegradable tea filters, tea-sipping playlist, and exclusive member perks.